World renowned wine writers Hugh Johnson and Jancis Robinson teamed up to create the perfect wine book for any beginner wishing to learn more about wine and the key wine producing regions of the world. 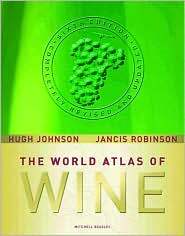 Since its first edition in 1971, the World Atlas of Wine has sold over 4 million copies in 14 languages. This book is definitely among the most significant wine publications to date. The book begins with a substantive overview of the basics of wine including history, grapes, viticulture, storage and serving. Following this introduction the book then delves into all the major and many of the minor wine producing countries of the world. Each country is separated into the wine producing regions which are then describes in detail (location, terroir, grapes, wine style, etc). Each chapter is accompanied by a painstakingly detailed map with vineyards, wineries, and grape qualities as well as beautiful pictures of the area and labels from key producers giving the reader much to absorb and making the book a true pleasure to read. Johnson and Robinson write in an understandable manner making this book easy for beginners, but also include information that even a more experienced wine lover could learn from. A glossary at the back of the book is an added bonus for those just learning the language of wine writing. Overall, this wine book is a definite must have for beginners and old hands alike.